While Twitter isn’t the most complex social network, there are a few features and functions you need to know about. Here’s where we run through the basics. More than a glossary but still just a starting point. We encourage you to explore and come up with some other creative ways to use these features. These are your 140 character posts and updates you make. You’ll also see there is an archive of every Tweet you’ve ever made. You can see both your own Tweets and other users’ Tweets. Scanning through another user’s recent Tweets will give you a good sense of what they spend their time on and what they value. A chronological collection of Tweets made by Twitter users you follow. Catch up on the day and see what people are saying. Find interesting, timely conversations and jump in. A list of activity related to your Twitter account including mentions, newest followers, retweets, likes, and additions to public lists. See who is listening to what you have to say. Say hi, acknowledge them, and keep them in mind when you’re deciding relevant content for your followers. This is your inbox for direct messages. Direct messages are 140 characters long and can be sent privately to Twitter users who are following your account. Think of them as private Tweets. It’s a great way to follow up with someone if they have a question or concern about your company that doesn’t need the whole world watching. This is the list of Twitter users you follow. Clicking on the Follow button on another user’s profile is a bit like subscribing. Every time they Tweet, you’ll see it in your Feed. Find influential people in your industry and keep tabs on what they have to say. When you follow them, they might be interested in following you too. This is the list of people who follow you. While your Tweets are public for everyone to find, your followers will see your Tweets in their feed. This is your core Twitter audience. If they like what they see from you, they’ll engage and retweet you spreading your messages and brand. This shows all the Tweets you have liked. You like a Tweet by click the small heart icon. Liking a Tweet is a great way to acknowledge another user’s message. It’s also a great way to get noticed by potential followers. When you constantly Like their Tweets, they’ll notice and may take an interest in learning more about you. A retweet is a reshare of the original Tweet. Clicking the small cycle icon will re-share that tweet to your followers. This is a great way to endorse another user’s idea or message. It pretty much says: “I agree and I think more people should see this.” This feature is the power behind Twitter’s ability to spread information around the world in seconds. Keep in mind you’re operating as a brand and anything you endorse or retweet will (forever) be associated with your brand. Pin one of your Tweets to the top of your profile so it stays visible, even as you post new Tweets. Pin the Tweets that people need to see. Maybe it’s a time- sensitive offer, maybe it’s a link to your latest blog post, maybe it’s just a great thought you want to share. Testimonial list: You can Like mentions or compliments to your business for future reference. To-do list: You can Like Tweets that you need to reply to once you’ve gotten back to your desktop or gathered more information. Read-later list: If you see a news item that you want to read later, you can Like the Tweet. 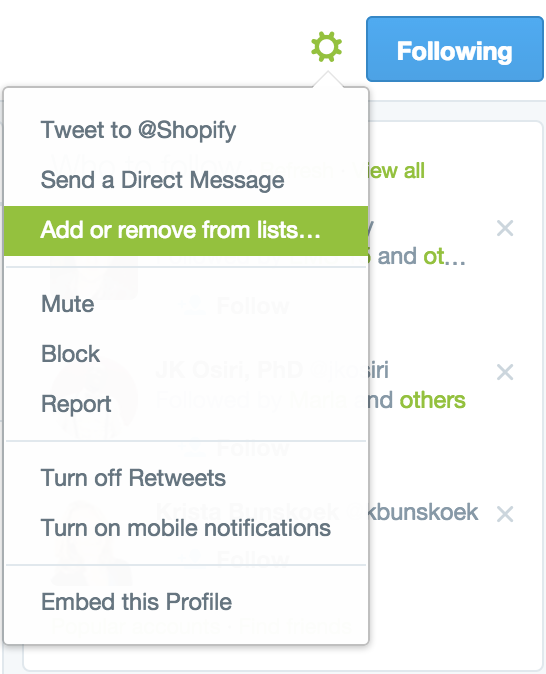 We’re going to pause here and take a second to appreciate one of Twitter’s hidden gems: Lists. Currently, Lists are a grossly underutilized aspect of the social network as the feature provides a way of segmenting and identifying interest-based groups among a sea of millions of users. Twitter lists can be used to follow the updates of a group of Twitter users organized by topic, category, or other commonality. You can create public or private Twitter lists with up to 500 Twitter users. You can create your own lists or you can subscribe to someone else’s list. To add someone to a Twitter list, go to their profile and click on the settings wheel icon next to their Follow button. Then, click the Add or Remove From Lists link. You will then be able to add the user to an existing list, or create a new list from scratch. Others can add you to Twitter lists as well. When people visit your profile, they can click on your Lists link to see the lists you follow, and the lists to which you have been added. Create a private list of your competitors on Twitter to follow and monitor their updates without it being public knowledge. Create a private list of the top influencers in your niche or industry and engage with them to get the word out about your business. Create a private list of existing customers so you can easily connect and engage with them. Create a public list of brands your business carries to stay up to date on their latest news and products. Create a public list of stores that carry your brand to learn about new locations or policies. Use tools like Audiense to automate Twitter list creation. We’ll talk more about advanced Twitter tools later on.